Apart from being the man and one of my favorite authors, Leo Tolstoy also had a great face. I sketched him today. Not sure why I haven't ever sketched him before. There are a few weird things going on with this drawing, but I think I like it still. 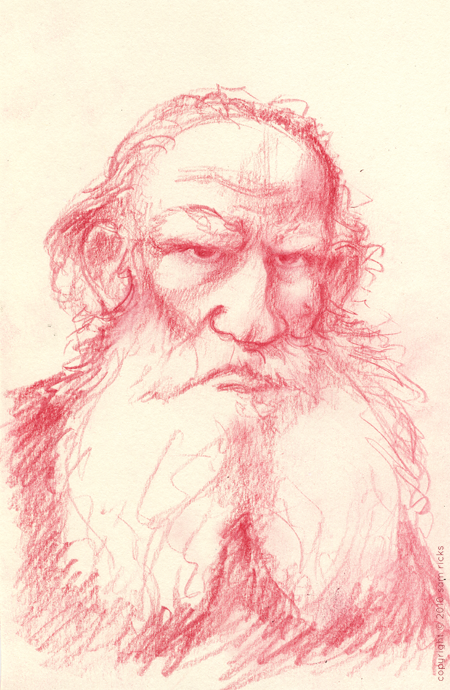 I drew him from several different reference shots, some of which you'll see if you click on the Tolstoy link above. I was trying to sketch him pretty loosely. And War and Peace is worth it. This is a great sketch. I love how rough it is. It works well with his face. Awesome.